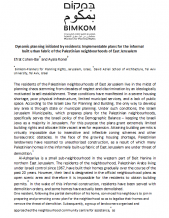 Bimkom has completed research, including case studies regarding the problem and a suggested, realistic solution for regularizing unlicensed building in Palestinian East Jerusalem. 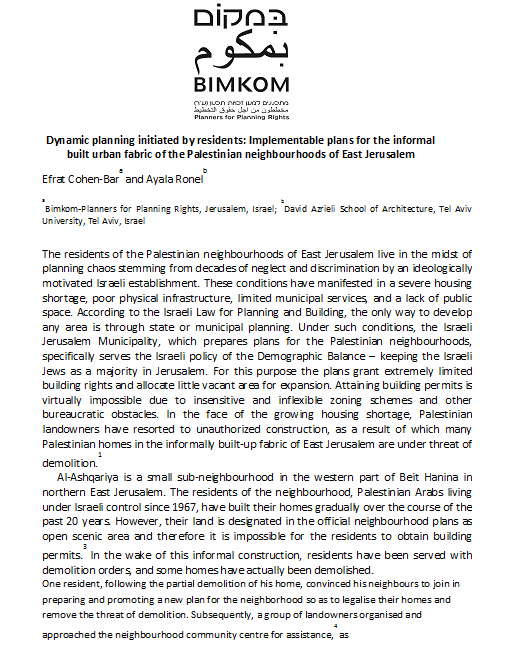 We prepared and published a position paper on this topic entitled, Resident Initiated Dynamic Planning: Implementable Plans in East Jerusalem . The methodology recommended is to encourage local residents to prepare detailed plans for small sections of their neighborhoods, which answer their needs for regularization as well as other planning needs. Through cooperation and compromise, they delineate the lands to be set aside for public use (for roads, infrastructure, open space and public buildings) based on the facts on the ground and the land ownership patterns. Such plans are therefore practically and socio-culturally implementable. Starting at the end of 2013, we began advocating among the planning institutions for the acceptance of this type of community-based planning. A meeting was held with the head of the Planning Department in the Jerusalem Municipality. Further meetings and discussions with major actors in the municipality and planning authorities are planned for 2014 Dynamic planning initiated by residents. This entry was posted in Publications, Publications, Uncategorized. Bookmark the permalink.